After what felt like 84 years, Once Upon A Time finally returned to television Sunday night for it’s third season. Several of our favorite Storybrooke characters traveled Neverland and it didn’t take long for things to spin out of control. Check out the Top 5 Moments from OUAT’s “Heart of the Truest Believer”. 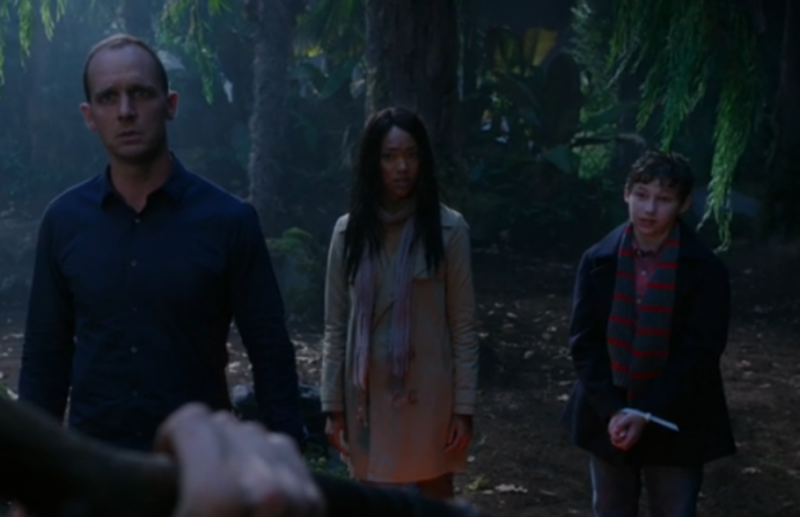 Greg (Ethan Embry) and Tamara (Sonequa Martin-Green) arrived in Neverland with Henry, and revealed they planned to destroy the land and all magic. Henry taunted his parents would come, but the duo doubted the boy’s words. As Greg and Tamara attempted to contact the others, they soon realized they were on their own, courtesy of a broken communicator. Greg decided to make a fire to give the home office a signal. Suddenly, The Lost Boys appeared from out of the woods. Greg and Tamara were confused, until The Lost Boys revealed they were the “home office”. Henry questioned why they would want to destroy magic. The head Lost Boy, Felix (Parker Croft), informed him it was all a lie to get Henry. Tamara demanded to know what the true plan was from The Lost Boys. Felix refused to tell her, so Greg balked at giving them Henry. Felix smirked, then all hell broke loose! A shadowy figure stole Greg’s soul from his body, and a Lost Boy shot Tamara with an arrow! Henry ran into the woods for his life, while Tamara fell to the ground in agony. Will Henry be able to escape The Lost Boys? As Henry (Jared S. Gilmore) ran away from The Lost Boys, someone suddenly pulled him to safety. This someone was a teenage boy, who cut Henry’s hands free of the zip tie. The boy admitted he was a former Lost Boy, and would help Henry escape from them. He warned Peter Pan always knows what happens in Neverland, but they had to keep moving to lose The Lost Boys. Henry and the teenage boy managed to get away from The Lost Boys for a brief moment. They exchanged stories of how they ended up in Neverland, and why Peter Pan was after them. The teen stole some pixie dust from him in an effort to fly away home, but he hasn’t been successful in getting it to work. Henry told the teen he was sure his family was coming, but the teen didn’t believe him. Henry reassured the boy they were coming, and asked if there was a place they could hide from The Lost Boys. The teen told Henry The Lost Boys couldn’t follow them to The Echo Caves, but it was far away. Henry advised the teen not to lose hope, and lead them to the caves. On the way to the caves, The Lost Boys attacked Henry and the teen. They had to maneuver around them, and ended up on the side of a cliff. Feeling trapped, the teen thought about giving The Lost Boys the pixie dust to get rid of them. However, Henry had a better idea. He grabbed the pixie dust, and suggested they fly to the caves. The teen reminded him the dust didn’t work, but Henry knew otherwise. He believed it would work, and jumped off the cliff with the teen. It worked. The duo magically flew to their destination. When they landed, the teen thanked Henry by his name for all his help. Immediately, Henry knew something was wrong, because he never told the teen his name. 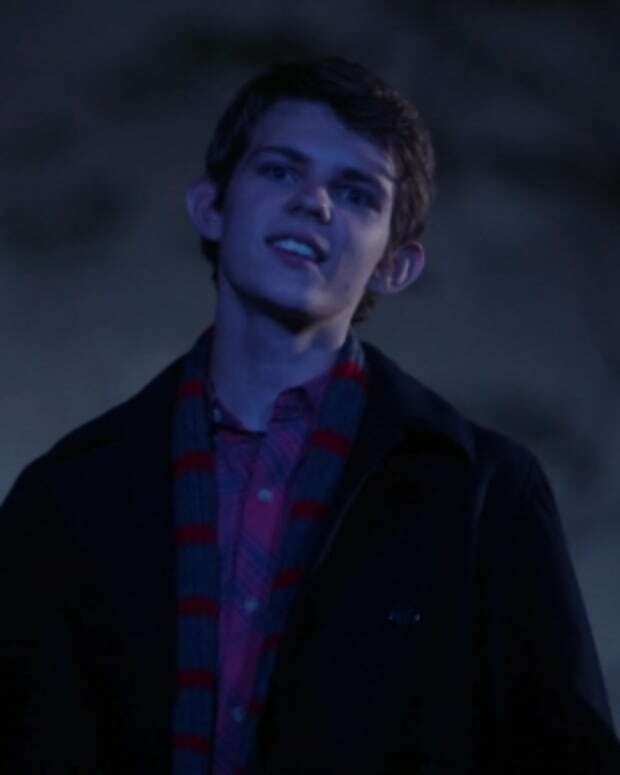 It turns out the teen is actually Peter Pan (Robbie Kay). He was looking for the person with the “heart of the truest believer”. Henry was he. How will Henry get out of this mess? When the group arrived in Neverland, Rumpelstiltskin (Robert Carlyle) decided he didn’t need the rest of them to find Henry. He informed everyone he was going to do it alone, and they would never succeed. With the turn of his cane, Rumpel disappeared into thin air. No one on the ship seemed amused. Rumpel roamed around Neverland until he found a mortally wounded Tamara. He asked her about Henry, and healed her wound with magic. 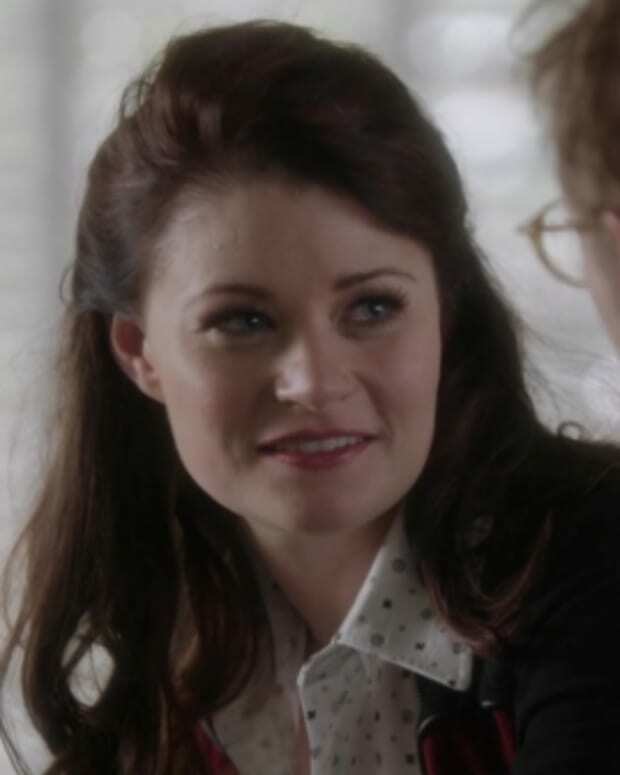 She thanked him, and confessed Henry ran in the forest after the scuffle because Peter Pan wants him. Tamara also promised Rumpel she had no idea who she was working for, and apologized for Neal. She asked Rumpel for forgiveness, but he refused. Rumpel ripped her heart out of her chest and squeezed it into dust! Farewell, Tamara. Rumple continued his quest to find Henry and ended up in a meeting with Felix. The two were clearly previously acquainted. They had a chat about Peter Pan. Felix had a message for Rumpel from Peter Pan. 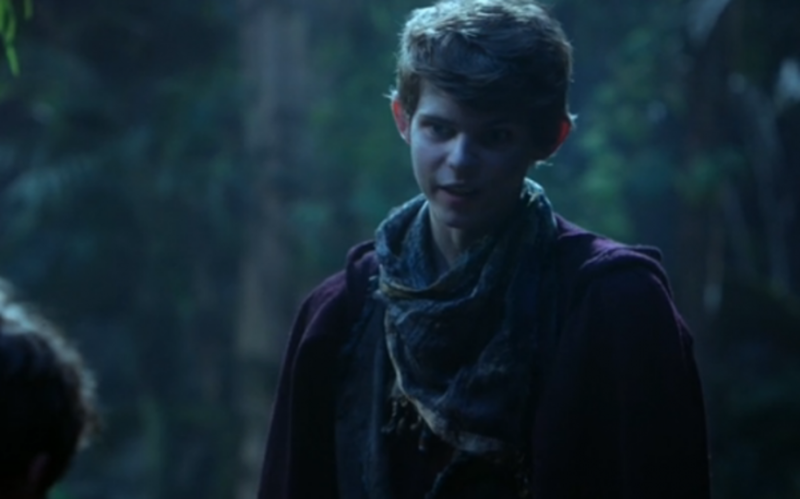 Pan welcomed Rumpel in Neverland and gave him permission to stay as long as he wanted. However, if Rumpel was in Neverland for Henry, he was officially Pan’s enemy. 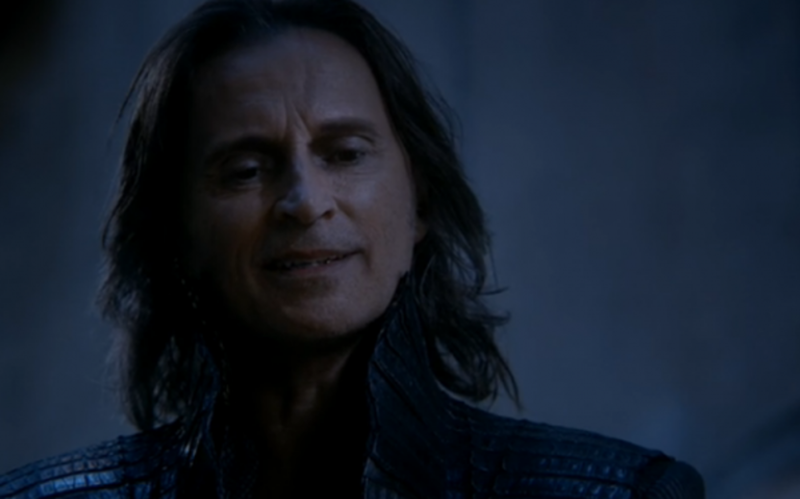 Felix warned if Rumpel went against Pan, he would not survive. 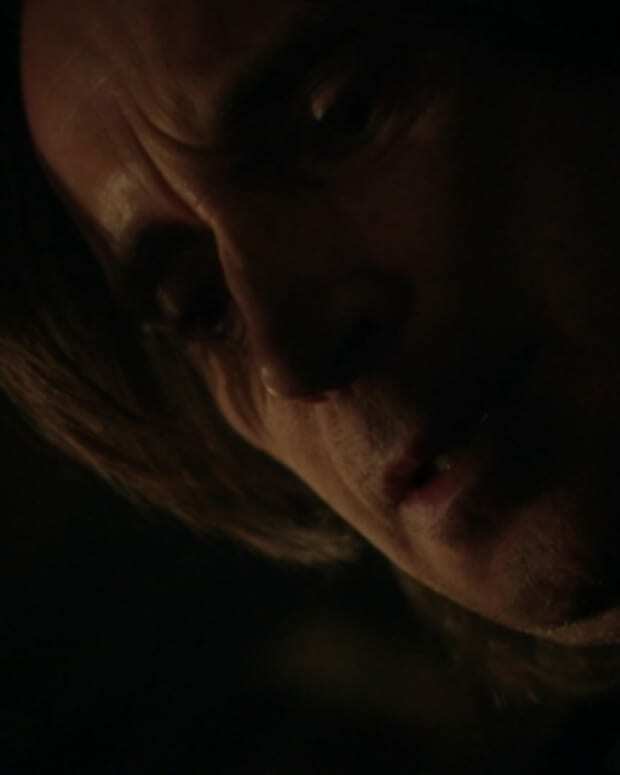 Rumpel knew he wouldn’t survive, but he vowed to take a few Lost Boys with him down his dark path. Rumpel started to leave, but Felix had one last message from Pan. He threw a small doll at Rumpel’s feet. The Dark One began to sob. What is the significance of the doll to Rumpelstiltskin? After Regina (Lana Parrilla), Mary-Margaret (Ginnifer Goodwin), David (Josh Dallas), Captain Hook (Colin O’Donoghue), and Emma (Jennifer Morrison) were attacked by a group of mermaids on the way to dock in Neverland, they encountered an even bigger problem. Emma and Mary-Margaret managed to capture one mermaid. She blew into a large seashell to create a powerful storm. The group debated on whether to kill the mermaid to stop the storm, but Regina had another plan. She used her magic to turn the mermaid into wood, but the storm raged on. Mary-Margaret shouted at Regina to change the mermaid back, so they could possibly get her to reverse the storm. When Regina refused, Mary-Margaret punched her in the face! Regina didn’t take the hit lying down, and socked her one back. The fight was on between the two women, while the storm intensified. David went to break the women up, but Hook stopped him. Hook called the women a derogatory term, and begged David to help him with the wheel. David didn’t like what Hook called his wife, and the men began fist-fighting. Emma held the wheel tight, as she overlooked the fighting men and women. She quickly figured out the mermaid created the circumstance for the storm, but the fighting between her crewmates was making it worse. She told them to stop, but they wouldn’t listen. 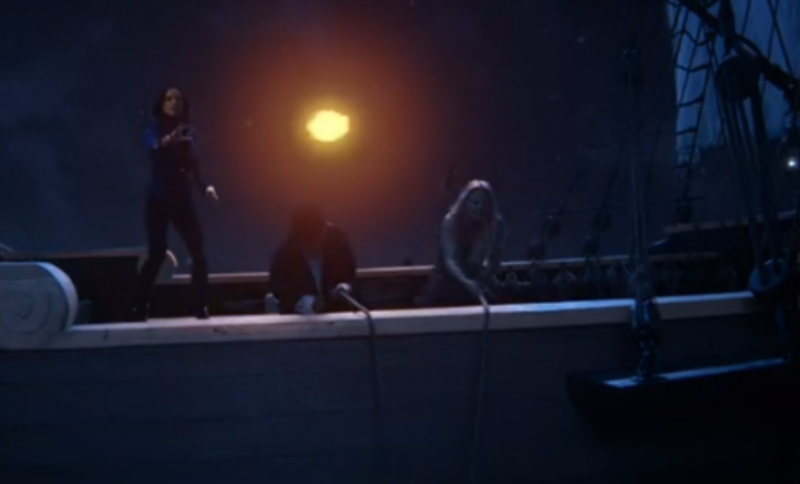 Emma took matters into her own hands, and jumped off the side of the ship. Instantly, the fighting stopped and everyone rushed to the spot where Emma jumped into the water. Mary-Margaret ordered Regina to save Emma with her magic, but Regina couldn’t because it was impossible to locate her in the water. So, David tied a rope around his waist and dove into the water. He grabbed Emma, and the group pulled them back onto the boat. Mary-Margaret and David held their daughter, as she began to spit out water. The storm finally subsided, as Emma uttered, “I told you.” Can the group play nice long enough to save Henry? Mulan (Jamie Chung), Sleeping Beauty (Sarah Bolger) and Prince Phillip (Julian Morris) nursed a wounded Neal (Michael Raymond-James) back to health. He awoke confused about his surroundings, but the group quickly settled him down. Mulan knew he was from the same world as Emma and Snow, because of his clothes. Emma’s name rang a bell for Neal. Everyone discussed their various connections. Sleeping Beauty figured out Neal was Henry’s father. 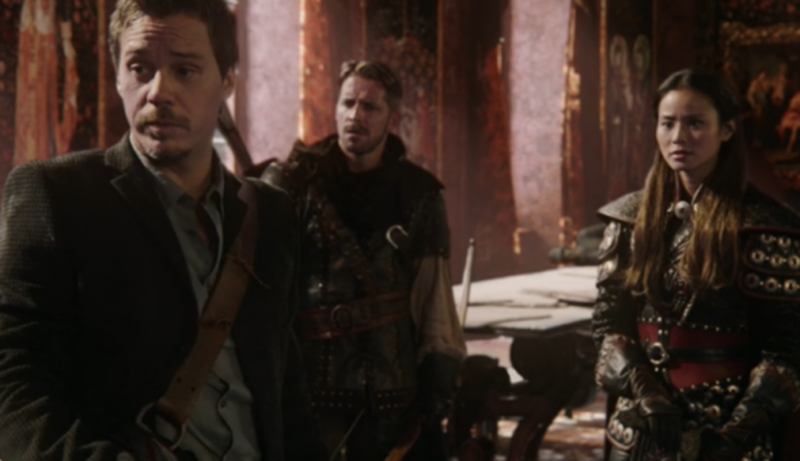 The group informed Neal he was in The Enchanted Forest, but he only wanted to get back to Emma. He informed them he ended up in the Enchanted Forest by falling through a portal. Apparently, whatever location one thinks about in a portal is where one ends up. He knew he might be able to reach her by going to his father’s old castle. On the way to the castle, Neal and Mulan shared a few Emma stories. When they arrived at the castle, they discovered Robin Hood (Sean Maguire) wielding an arrow at them. He took up residence in the castle after the curse. Neal asked to look around the castle, because it used to belong to his father. Due to Robin Hood owing Rumpel a favor, he allowed Neal to look around. Neal picked up Rumpel’s old walking stick and swung it around. When he stopped, a magical closet appeared in place of a painting. Neal opened the closet, and inside were several trinkets. He saw a crystal ball and decided to use it to locate Emma. After a failed attempt, Mulan advised him to think of his love for Emma and try again. Neal followed Mulan’s words, and discovered Emma was in Neverland. How will Neal reach Emma and Henry in Neverland?